While President Obama was ridiculed for the failures of the HealthCare.gov rollout, botched state-operated exchanges did not prove to be much better. As HealthCare.gov sat useless for weeks and months, the few states that built their own ObamaCare exchanges struggled with countless failures and setbacks. A couple of state exchanges—Kentucky and California—worked relatively smoothly. However, in most states the insurance exchanges were, if you can believe it, even worse than Obama’s. The Oregon health exchange—Cover Oregon—stood out as the worst. In 2014, then-Governor John Kitzhaber, Oregon’s longest serving governor and full-on progressive Democrat—was in a high stakes reelection campaign. The ambitious Democrat needed to weather a storm of controversy around his campaign (he would win reelection with less than 50 percent of the vote in deep blue Oregon), and conceal the complete failings of his administration’s ObamaCare state-based health exchange Cover Oregon. Kitzhaber hoped that his state’s health exchange would be a testament to activist government. Instead, Cover Oregon had become a laughingstock. The entire fiasco of mismanagement and missed deadlines posed a threat to Kitzhaber’s legacy as a progressive champion for healthcare reform. So, he surreptitiously handed over control of the Cover Oregon mess to a key campaign consultant—Patricia McCaig—who called herself the Princess of Darkness. Ms. McCaig knew nothing about healthcare policy, but that did not matter. Her job wasn’t to fix Cover Oregon; her job was to get Kitzhaber reelected. Oregon’s ethics and election laws require a separation between political activity and official decisions. Regardless, the Princess of Darkness (you can’t make this stuff up) believed that the health site’s failure was so politically toxic that she decided to pull the plug. Kill it. Hit the eject button, and flush over $300 million in taxpayers’ dollars down the toilet. Government records and internal emails confirm that McCaig—not state officials—directed the decision to close down Cover Oregon rather than work with the state’s contractor, Oracle Corp., to repair the doomed site. Who cares? As long as Kitzhaber won his bid for a fourth term, the ends would justify whatever means. Adding insult to injury, the Princess of Darkness then pushed to sue Oracle in a shady effort to deflect blame. The state is now embroiled in lawsuits and former Oregon officials are under myriad congressional and federal investigations. Facing state and federal criminal investigations, Kitzhaber himself was forced to resign in disgrace earlier this year amid corruption charges and accusations of influence peddling. His handing off Cover Oregon to his chief political consultant and political hacks is but a piece of an overall environment where decisions were based on Kitzhaber’s political interests rather than what was best for the people of Oregon. 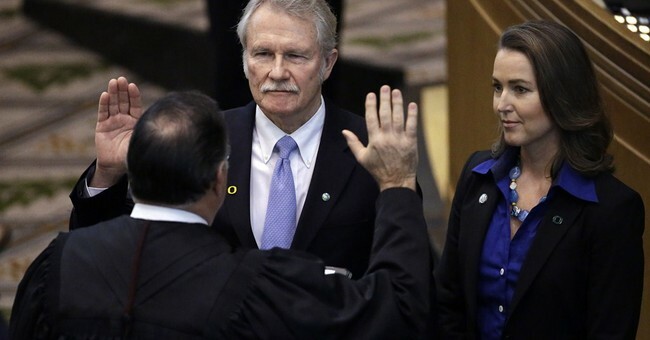 Like Alexander from the children’s book “Alexander and the Terrible, Horrible, No Good, Very Bad Day,” perhaps it would have been better for John Kitzhaber to have just moved to Australia. Well, it’s too late for him. However, it’s not too late for other governors to learn from Oregon’s failure. The Supreme Court will issue its decision in King v. Burwell this month. It would be best for the states to work with Congress to craft post-King solutions that will provide market-based healthcare solutions to our nation’s healthcare woes. Governor Kitzhaber and Cover Oregon is a cautionary yet familiar tale. Big government and corruption are inextricably intertwined. King v. Burwell might give us a rare opportunity to hit the reset button.